From uncertain economic conditions to volatile markets, clients and Financial Advisors have made some difficult decision in adapting to the ever evolving financial landscape. Adaptation has resulted with a defined client focused approach; understanding our client’s thoughts, ideas and goals to effectively create a professionally managed solution for a fee in lieu of commissions. Chapin Davis has access to advisory products as well as, the experience to construct a professionally customized financial model. The Contrarian Value Portfolio is a diversified portfolio of equity securities constructed by Ms. Gale Costa, Portfolio Manager. 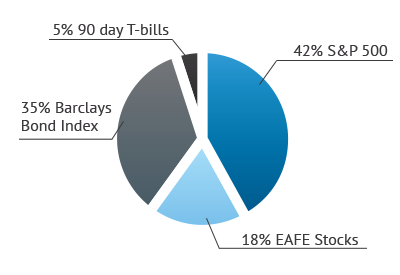 The Portfolio Manager uses a value-oriented investment style to select stocks that trade at low prices relative to anticipated earnings and have above-average dividend yields, and to select growth stocks that offer value because their purchase prices do not reflect their potential for future growth. The Portfolio Manager seeks investments in companies with strong underlying fundamentals, such as recognized trademarks, strong balance sheets and profitability, but whose share price is temporarily depressed due to a solvable company problem or external factor. Contrarian Value Portfolios primarily invest in equity securities of large-capitalization U.S. companies or foreign companies listed on a U.S. Exchange through American Depository Receipts, although investments may also be made in small- and mid-capitalization companies. JRB Capital Portfolio I is an actively managed portfolio of large-capitalization stocks, ETFs, and the shares of financial institution constructed by John R. Boo. The portfolio avoids leverage, speculative stocks, industries that demand a high level of specialized expertise and investments with a tendency towards extreme volatility. Mr. Boo takes a patient, long-term oriented approach to investing, and attempt to strike a comfortable balance between return on capital and return of capital. We attempt to address the specific needs of individual investors by accommodating their particular tax and capital gains situation, needs for cash buffers, other special situations. The overall investment strategy is to capitalize on our perspective on the financial sector based upon decades of experience as an extremely active, deeply involved participant in the trading and sales of securities issued by financial institutions. 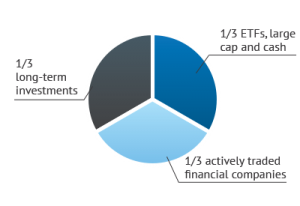 We seek diversification by committing approximately 1/3 of the portfolios to ETFs, large cap and cash. The large-cap portion of the portfolio offers investor insulation against sector risk inherent in the portfolio’s holdings in financial stocks. We strive for liquidity and risk mitigation by committing an additional 1/3 of the portfolio to the shares of financial companies whose stocks are actively traded. The final 1/3 of the portfolio seeks above average long-term returns at below average risk by accumulating the shares of smaller, less liquid bank and financial institutions whose market valuations have historically been inefficient. A key component to stock selection in the smaller bank space is an effort to identify banks which are most likely to be acquired at a premium to market price in the future. JRB Portfolio management decisions are made based upon fundamental analysis of stocks, general views of the markets, and interpretation of relevant macroeconomic factors. Decisions regarding financial stocks involve the use of traditional valuation metrics; price to book and price to earnings rations, loan loss assessments, ROE and ROA, but to take into account the likelihood that an institution will be sold at a premium price. 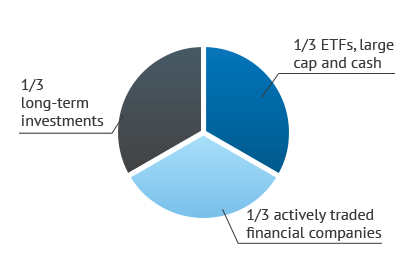 We too rely on our lengthy experience, industry knowledge, and a network of like-minded and common defined approaches. Mr. Boo has been trading and investing in the shares of financial institutions since 1983. He was employed by Ferris, Baker Watts, Inc. as an equities trader from 1986 until FBW was acquired by the Royal Bank of Canada in 2009. Mr. Boo served as the Director of Equity Trading for the final 18 years of his tenure at FBW, during which time he was instrumental in building FBW into the premier firm focused on eastern banks and financial institutions. He earned a B.A. in Economics from the University of Dallas, and is a Past-President of the Mid-Atlantic Traders Association. The S&P 500 Relative Strength is an actively managed portfolio constructed by Talbot Jones Albert, IV. Mr. Albert has a disciplined approach of dividing the S&P 500 into forty sectors with no more than 10% initially invested in any one sector and no more than twenty five positions overall in the portfolio. The criteria used during active management are those positions with the greatest positive relative strength versus the S&P on a Point and Figure buy signal generated through technical analysis. Benchmarked against the S&P 500, these securities are filtered daily for new positive P&F buy signals. 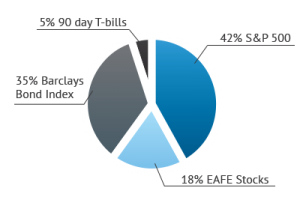 60/40 Global Equity is managed by Thomas E. Jester has established the primary investment objective of 60/40 global equity portfolio to capture a preferred market return with the equivalent risk of an investment comprise of 42% in the S&P 500; 18% in EAFE indexed stocks; 35% in the Barclays Corporate Government Intermediate Bond Index and 5% in 90 day T-bill rates. The portfolio is suitable for those seeking long term growth and income with or without reasonable liquidity requirements. Separate Account/Wrap Fee Manager, pursuant to which Chapin Davis provides non-discretionary investment advice to separate accounts established through wrap fee or private manager programs sponsored by independent broker-dealers. Portfolio Managers may rely on both fundamental and quantitative research and develop specific investment strategies using a mix of these methods. Investment strategies typically include equity and fixed income strategies, asset allocation, ETF strategies, customized portfolios and mutual fund asset allocation. Eligible securities for these types of accounts typically include common and preferred stocks, ETFs, closed end funds, unit investment trusts, corporate and government bonds, certificates of deposit, options, structured products, and no-load or load-waived mutual funds. Clients who meet financial sophistication standards may elect to invest in certain alternative investments, such as hedge funds and managed futures funds. Portfolio Managers may engage in covered call writing, options strategies and trading or short sale transactions. Portfolio Managers also may assist clients in identifying independent investment managers to manage the clients’ assets on a discretionary basis.